"Alice hoped to find peace after the death of the Red Queen. Instead, she faces a new foe: a plague of madness that threatens to bring Nod to its knees, shaking the foundations of the afterlife. Forced to flee from her home and abandon her throne, she is led on a journey that has the potential to remake or break her. From the forest world of the Fae to the expanse of the multiverse, Alice and Zee search desperately for a cure before it's too late. Along the way, they meet new companions and enemies - the powerful and deadly Magi, the changeling princess Maggie, and the Triad, a sinister trio of brothers who would stop at nothing to subjugate all they see. The fate of Nod hangs in the balance, and the key might just lie in the one place Alice has never dared to go - the depths of her own mind." I read and reviewed the first book in The Balance series, Child of Nod, earlier this year and was deeply impressed by this darkly imaginative take on the classic Alice in Wonderland story. In this series, Alice wakes up to find herself not in Wonderland, but in Nod, a corrupted fairy tale land where she also discover that she is, in fact, dead. In Child of Nod we got to know Alice as she discovered exactly where she was and what her purpose was, and now in Queen of Nod we get to follow Alice as even more challenges befall her as she takes on her role as queen. As a sequel, Queen of Nod did not disappoint me in the slightest and is just as imaginative and sinister as the first book. I wasn't entirely sure where the story would pick up in the sequel or what the main plot conflict would be (and I won't give spoilers), so I was very pleased to see the direction that Snyder did choose to take the story. One of my favorite aspects of the first book was the inclusion of so many different hints of different myths and classic stories that popped up in various places, and I was so glad to see that this continued in this book. The pacing in this book also felt slightly faster than Child of Nod, and it seemed as though there was a bit more action overall in this book, which was a great addition. The world-building was expanded even more and there are a myriad of new creatures and beings introduced that I loved, although at times it did feel a bit overwhelming to remember everything. In Queen of Nod, we get a closer look in the inside of Alice's head, as that is where one of the main sources of conflict for this book lies. This was done with such an interesting perspective that added some extra depth to Alice's character and allowed me to dive further into the darkest parts of Nod along with her. Although we got to know Alice quite well in the first book, I didn't fully connect to her at the time and this book seemed to expand her character just enough to really help me feel more connected to her. There are plenty of gore and horror elements in this book, so do keep that in mind if you feel are sensitive to that sort of content. That being said, none of these elements are done in an excessive or unnecessary manner--it all seemed to fit the story and the specific event taking place at the time really well, and I appreciate Snyder's taste in that aspect. I also really enjoyed the way that the narrative tends to jump around at times between different (and sometimes unexpected) characters, especially since each one's voice felt very distinct from the other. There is oftentimes a dreamlike quality to the narrative that adds an extra element of intrigue to the storytelling. I love my stories dark and creepy, and that is one reason why I have enjoyed these books as much as I have. Snyder manages to tell a story that is endlessly creative and full of wonder, yet also incredibly dark, unsettling, and full of grim realities and frightful events. It speaks to something very real about our world and how this darkness seems to exist everywhere. 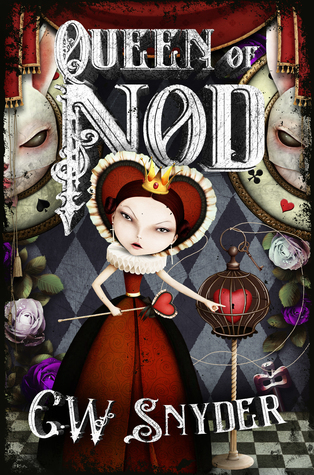 Overall, I've given Queen of Nod four stars! If you have an open mind and like some creepy Alice-inspired retellings or just some quirky, creative stories in general, then I encourage you to check these stories out.